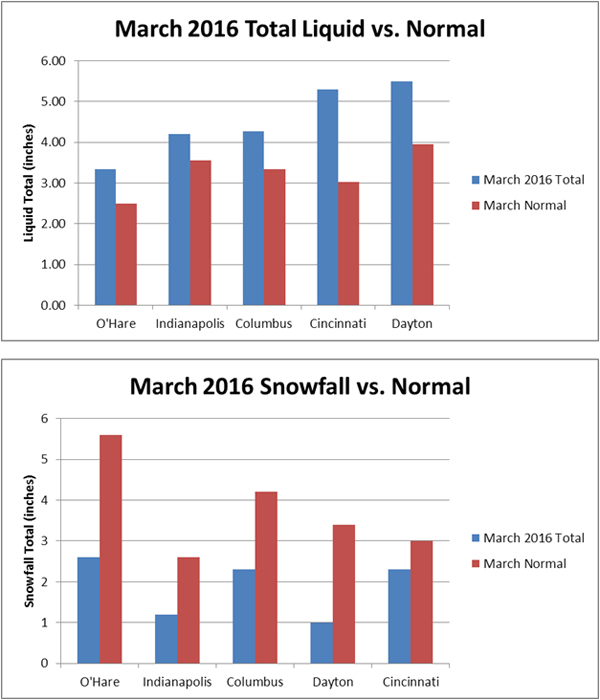 While February ended up warmer than normal, March had a much chillier, snowier start. Chicago was the first to partake in this return of winter. Right as we flipped the calendar, arctic air plunged southward, joining up with a storm system dropping out of the Pacific Northwest and sweeping through the Plains. This storm system produced anywhere from 1 inch of snow over Chicago Metro to Rockford, with up to 2 to 5 inches closer to the Wisconsin border. 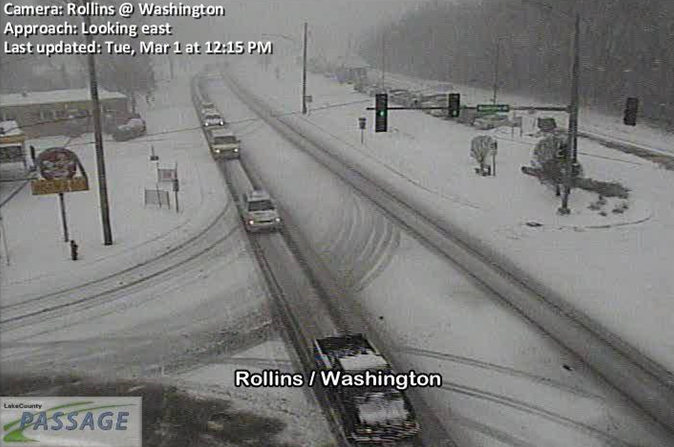 A couple more weak disturbances swung through the area during the first week of March, taking advantage of the colder-than-normal conditions and providing fresh coatings of snow for the rest of the Midwest. A warm up then began on the 6th with temperatures peaking on the 8th in many spots. For perspective, the high temperature at Chicago’s O’Hare Airport was 30 degrees on March 1st, but climbed to 70o on the 8th, a 40 degree temperature jump in just seven days! These mild temperatures were the mainstay for much of March. In fact, Chicago through the Ohio Valley did not see below-normal high temperatures again until the 19th. Although a few of the remaining days in the month were below average, March finished out anywhere from 5 – 7 degrees above normal throughout the Midwest. As for precipitation, totals for the month ran above average for all of the Midwest, finishing 15 to 50% above normal overall. 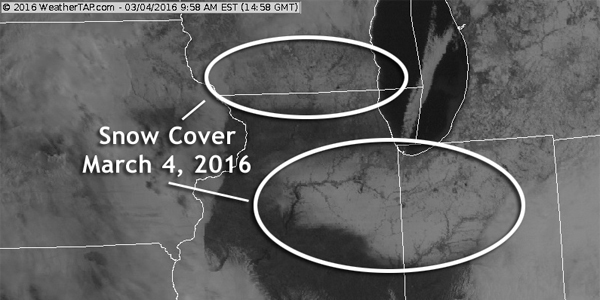 With the mild weather, it’s not surprising snowfall fell short of average from Northern Illinois to Indiana and Ohio. Many spots ended up 25 to 75% of average snowfall for the month [though some spots over Northern Indiana and Ohio may have exceeded or reached average). 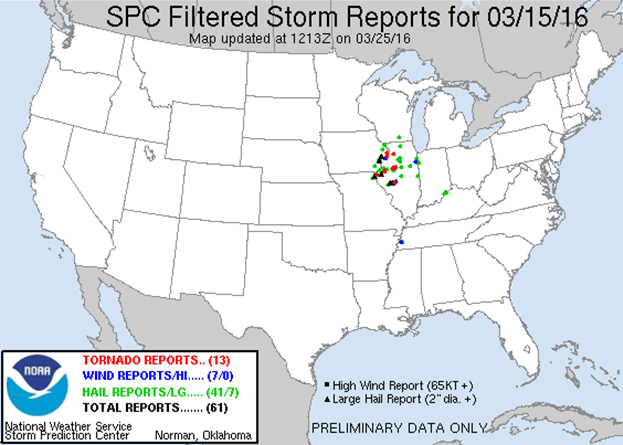 Typically March brings the start of severe weather and 2016 was certainly an active one. Thunderstorms on March 14th brought the first tornado of 2016 with a strong storm spawning an EF-1 twister near Phillipsburg in Montgomery County, Ohio. Just a day later on the March 15th, a cold front ignited severe weather in Illinois with a total of eight tornadoes, the strongest, an EF-2, in Peoria County. There were also numerous reports of hail with large, tennis ball sized hail in Morgan County, Illinois. After just over a week break in the active weather, severe storms returned to Indiana on March 24th, with two EF-0 tornados touching down. One impacted just northeast of Hanna, Indiana, the other southeast of South Wanatah, Indiana. On March 27th a deepening storm moving through the Great Lakes brought another round of severe weather as a strong cold front swept through Indiana and Ohio. There were numerous reports of hail across Indiana, the largest, ping pong sized, near Warren in Huntington County and near Wallen in Allen County. Ohio had several reports of hail along with numerous reports of strong and damaging winds taking down large trees, wires and even some structural damage. 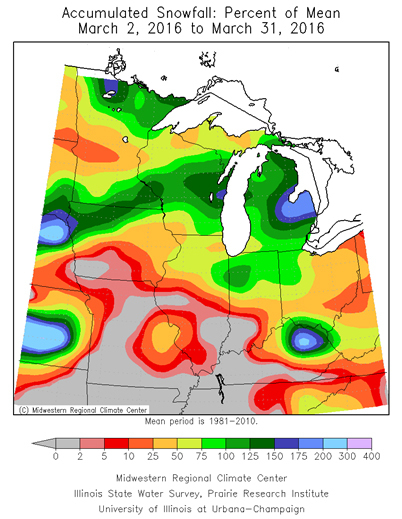 One last bout of severe weather ended out the month on March 31st, again, mainly across Indiana and Ohio. A tornado briefly touched southeast of Lafayette. Strong winds resulted in numerous reports of damage, mostly fallen trees, across Indiana and Ohio. As we head deeper into spring the strong El Nino that influenced the winter will continue to slowly weaken. Time will tell if the overall mild conditions induced by El Nino dominate April as well.